9:00 am rolls around all too quickly, and we are ready to hike again! I have been up since 6:00 a.m. enjoy my quiet time with a coffee in our room overlooking the misty morning Muong Hoa valley. 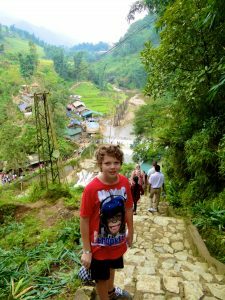 Every muscle in my body seems to be screaming for attention since our vigorous trek through the rice terraces and mountains yesterday. The precious memories and photographs are worth every ache and pain. 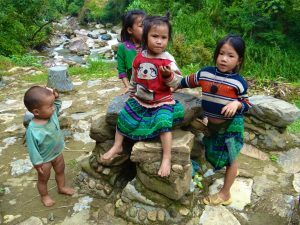 We set off through the busy streets of SaPa watching the Hmong ladies sit and finely stitch their handicrafts, or as mothers carry their young on their back, and children play in the streets. I watch as ‘young care for even younger little ones’ and it is no big deal to them. 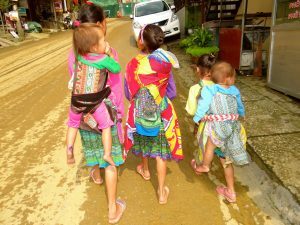 So different than the western world, and seemingly so much more colorful too! We walk at a leisurely pace and I notice both Explorason and me are doing just fine. Our muscles seem to be co-operating nicely, and we start to enjoy more of the countryside as we decent downward into the valley. 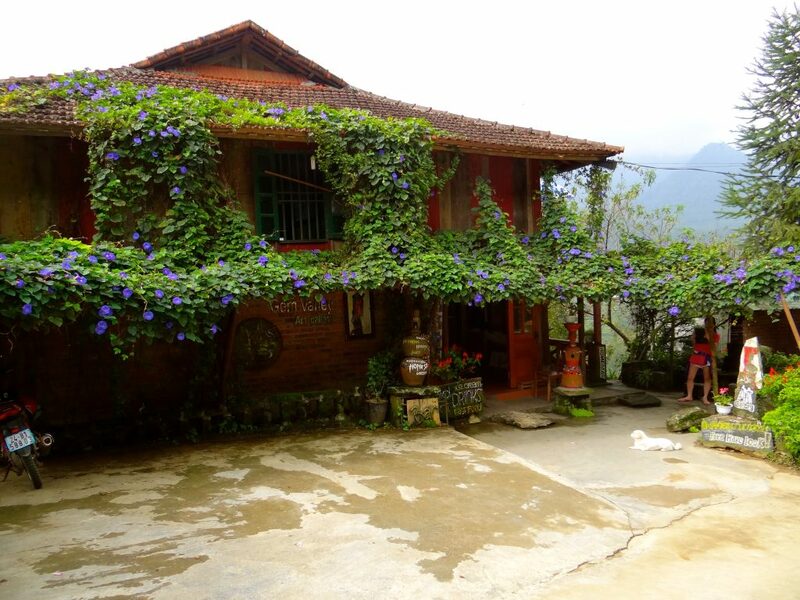 I adore the SaPa mountainside shops, homes, and cottages. 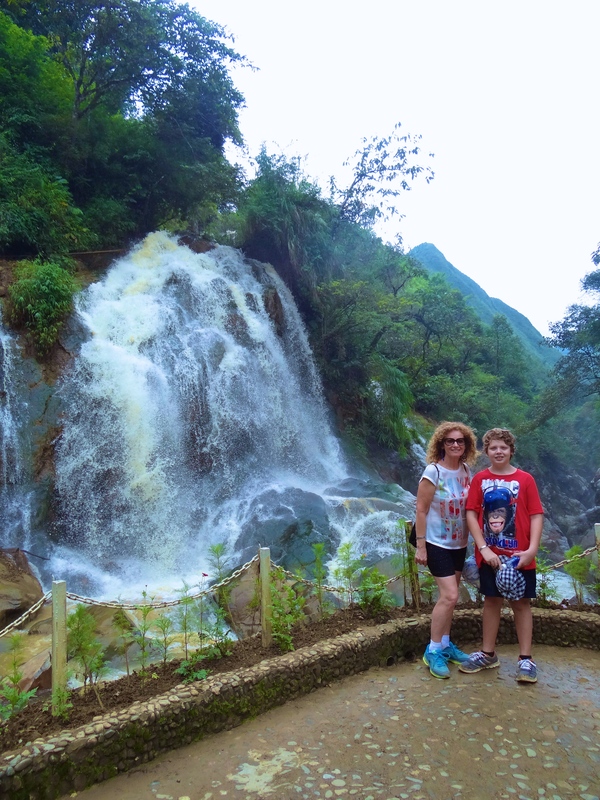 It is weird that it is warm, and I can imagine the difference in winter here as SaPa has four seasons, and it even snows in the mountain area not far from here. I wish I could stop and spend an afternoon staring out over the valley here. I have already decided I want to come back here to this region again! 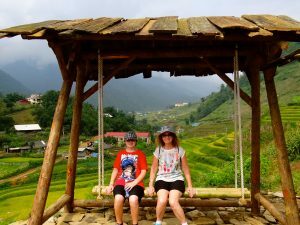 I’d never have known about SaPa if it wasn’t for our Legend Travel Group tour, and with our love for the ‘road-less-traveled’, this tour is perfect for us. 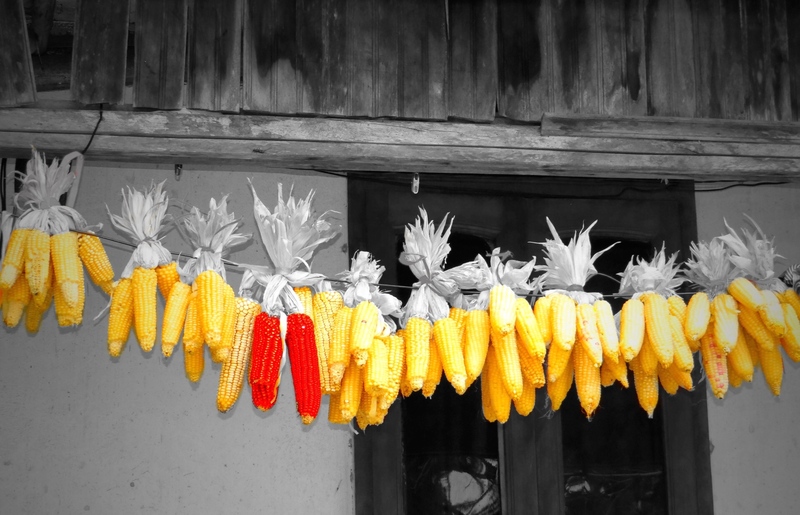 I love the way the corn hangs to dry from the front of the houses. 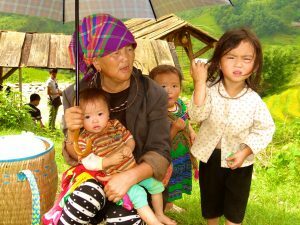 Local ethnic tribes live in the hills and valleys surrounding us and still dress traditionally. 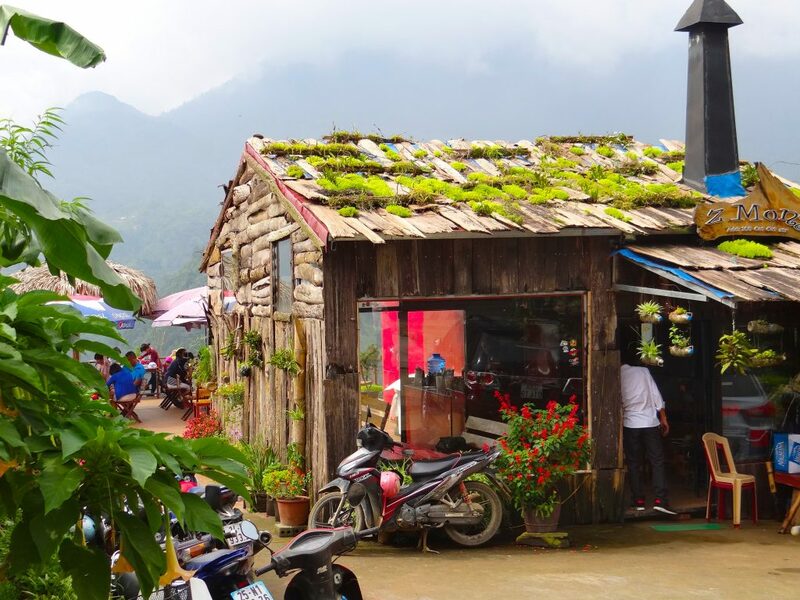 This gives the areas of SaPa so much charm and appeal. 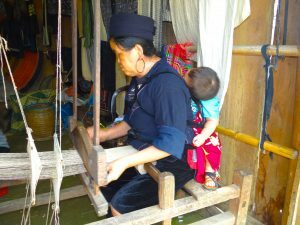 Children seem to be cared for by the grandmothers or are happily playing alone. There seems a mix of very poor amongst them too. I look with dread as well-meaning tourists distribute handfuls of candy and sweeties to these children who gobble them up with glee. I’ve never seen so many bags of lollies and sweet-treats distributed as I did on this day! 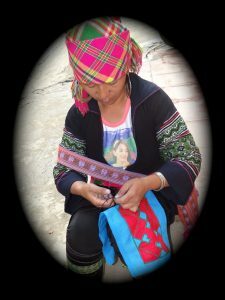 As we walk along, our local and very happy Hmong lady guide shares with us all about her marriage and the ways of the local people. Her marriage was arranged by her family, and she has married an older man who had many girlfriends before their marriage. She assures us this has now ceased as they have children. We then learn about the hemp fabric they make and how laborious this task is. The marijuana is NOT the same as the medicinal or smoking dope. The leaves are not used. 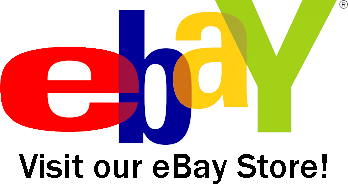 Rather the stem is stripped finely. 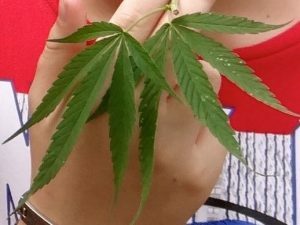 The marijuana is then boiled and softened so the fibers (fibers) that can be turned into a string-like twine that is woven. After this, the leaves of another plant called Indigofera are used to make the Indigo dye. 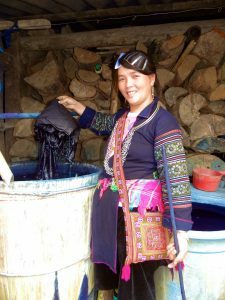 We see the plant and she explains the process, and we have seen most of the women have permanently blue stained hands from working with the Indigo dye. It forms a denim-like fabric, and the skill has been passed down from generation to generation. 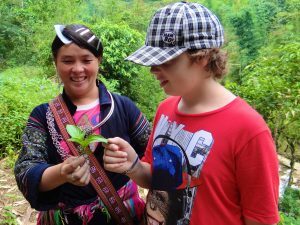 Today’s tour is included as part of our 17-day Vietnam tailor-made Legend Travel Group tour. 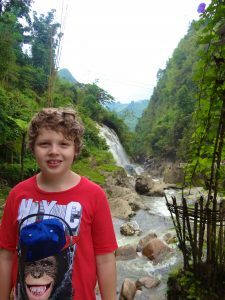 It is not an optional extra, so everyone on our tour group have joined us on this walk to Cat Cat Village and Tien Sa Waterfall. 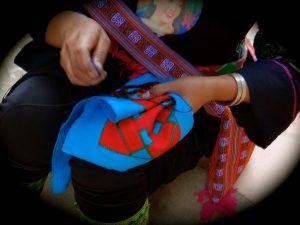 Everywhere we walk, we see the ethnic ladies busily working. They sit in the shade if they can find it, and others perch themselves on a rock or are seated outside a shop or home. This is not a lazy group of people by any means. 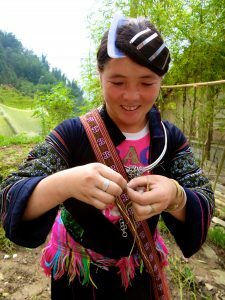 They are constantly stitching and making handicrafts and are hard-working people. 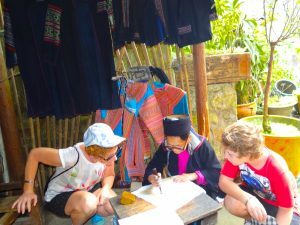 Cat Cat village is very busy with visitors because it is so close to Sapa, but this means tourists are well catered for with swinging seats and shaded shelters. 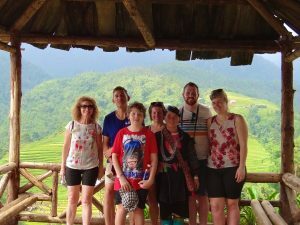 We take a moment for our tour group to get a photo, but as we ask a local person, we have to explain to them how they can use my camera. This takes a while, but it is quite fun. I am sure they had a story to tell that night over dinner! We then walk down to the river using stone steps. 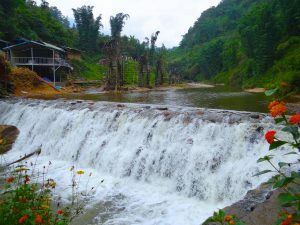 A few water wheels are twirling with the pressure of the current below, and a bridge is there to cross over the cascading waters. 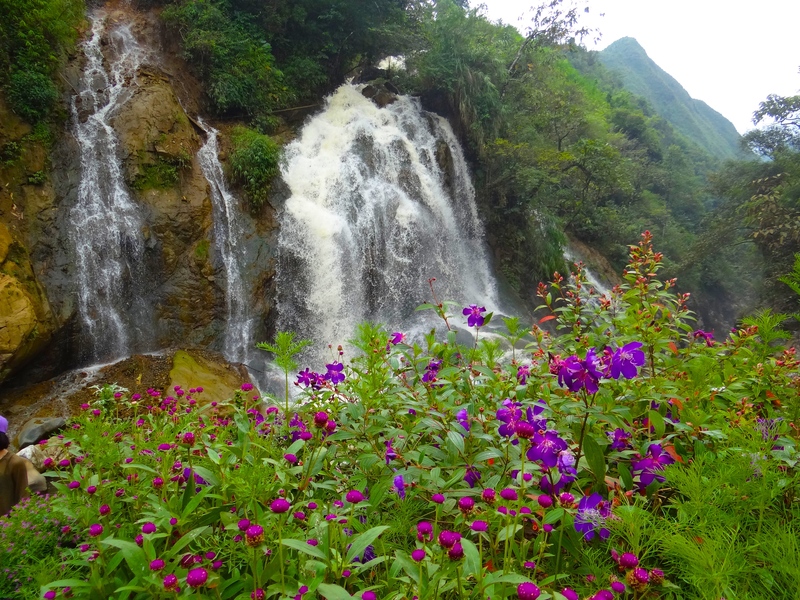 The front of my thighs feel every downward step, and I am glad to reach the waterfall !!! It is a pretty area and Tien Sa Waterfall is very close to Sapa village, and most tourists can walk down the 2-3 km road and track easily to get here, so it is a popular location. 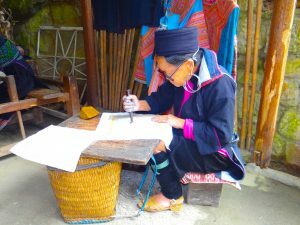 We were really taken with this older lady meticulously scoring lines into hemp fabric seated in an open-sided hut by a theatre (theater) with traditional Vietnamese dancing. I believe she is making a ‘funeral cushion’. 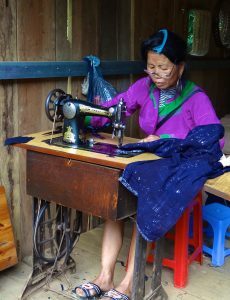 Fresh and new hemp fabric is used, and she carefully cuts lines and then rubs them with dye from a mustard-colored block. Not that I am planning on dying myself for quite a while, but I do wish I had bought one of these cushions. The detail was incredible, and she was very skilled. Because Explorason loves his art, he found this quite enthralling and wanted to stay a while and watch her work. Even the local food was interesting. 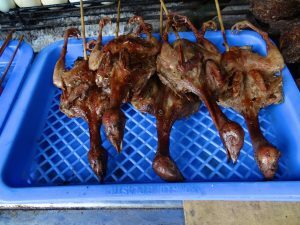 Young birds were charcoaled and skewered over the small grill – not your average kebab! 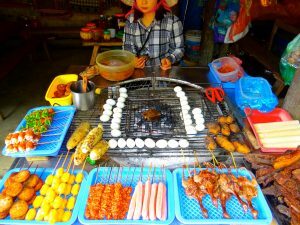 Cooked eggs and other traditional foods were on hand to buy from the local vendors. As we left, we bought a small dark wood carving of a Vietnamese lady from an elderly man as we wandered back up the other side. It was covered in a layer of dust and felt heavier than the statues we have seen for sale elsewhere, and it looks quite old. His hut-style stall was full of what looked like mainly junk and old wares and what could be a few antiques. 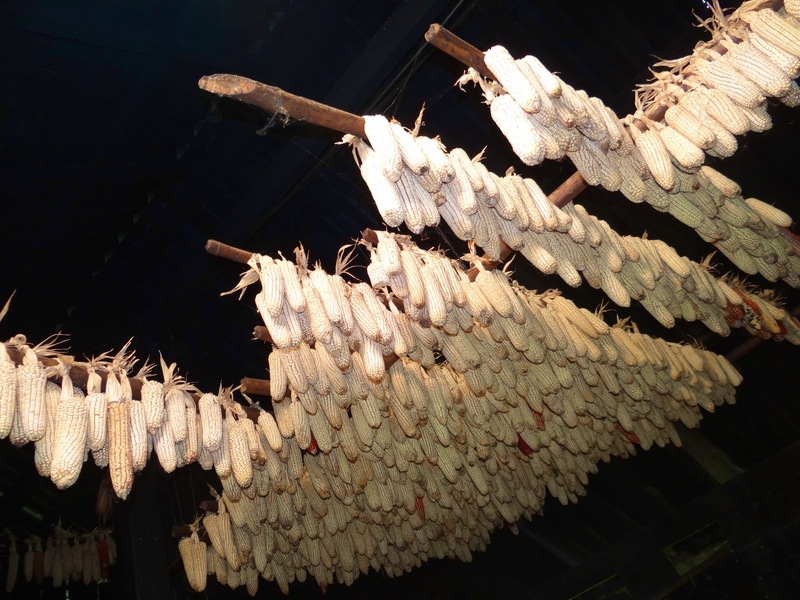 Thankfully, our tour included a lovely air-conditioned van ride back up the hill – once more past the houses drying their corn. 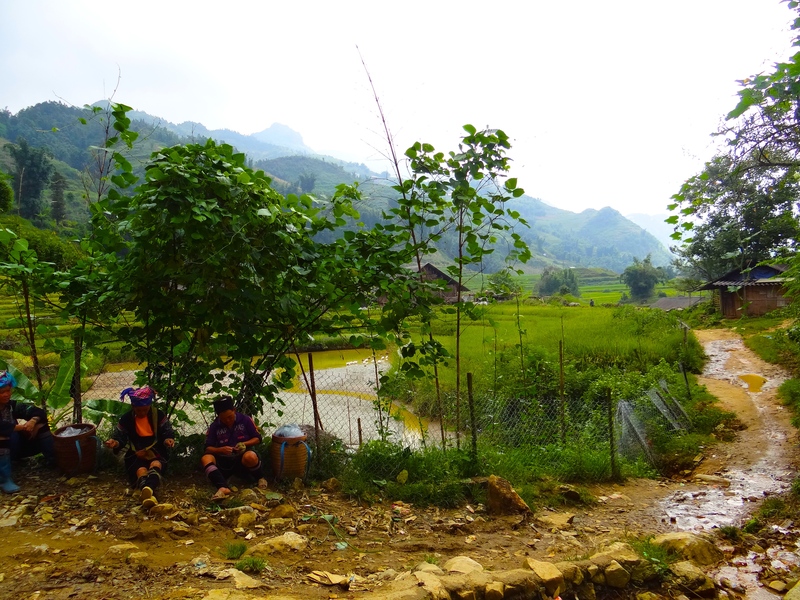 I watched as other tourists slowly hiked in the midday sun, or rode on the back of a motorbike. 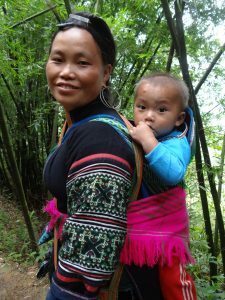 I was ever so glad to be seated in the cool of this vehicle which returned us straight to the Bamboo Sapa Hotel door!